Sunday, June 5th, we were in lat. 19š 29' S., and long. 118š 01' W., having made twelve hundred miles in seven days, very nearly upon a taught bowline. Our good ship was getting to be herself again, had increased her rate of sailing more than one-third since leaving San Diego. The crew ceased complaining of her, and the officers hove the log every two hours with evident satisfaction. This was glorious sailing. A steady breeze; the light trade-wind clouds over our heads; the incomparable temperature of the Pacific,—neither hot nor cold; a clear sun every day, and clear moon and stars each night; and new constellations rising in the south, and the familiar ones sinking in the north, as we went on our course,—“stemming nightly toward the pole.” Already we had sunk the north star and the Great Bear in the northern horizon, and all hands looked out sharp to the southward for the Magellan Clouds, which, each succeeding night, we expected to make. “The next time we see the north star,” said one, “we shall be standing to the northward, the other side of the Horn.” This was true enough, and no doubt it would be a welcome sight; for sailors say that in coming home from round Cape Horn, and the Cape of Good Hope, the north star is the first land you make. These trades were the same that, in the passage out in the Pilgrim, lasted nearly all the way from Juan Fernandez to the line; blowing steadily on our starboard quarter for three weeks, without our starting a brace, or even brailing down the skysails. Though we had now the same wind, and were in the same latitude with the Pilgrim on her passage out, yet we were nearly twelve hundred miles to the westward of her course; for the captain, depending upon the strong south-west winds which prevail in high southern latitudes during the winter months, took the full advantage of the trades, and stood well to the westward, so far that we passed within about two hundred miles of Ducie’s Island. It was this weather and sailing that brought to my mind a little incident that occurred on board the Pilgrim, while we were in the same latitude. We were going along at a great rate, dead before the wind, with studding-sails out on both sides, alow and aloft, on a dark night, just after midnight, and everything was as still as the grave, except the washing of the water by the vessel’s side; for, being before the wind, with a smooth sea, the little brig, covered with canvas, was doing great business, with very little noise. The other watch was below, and all our watch, except myself and the man at the wheel, were asleep under the lee of the boat. The second mate, who came out before the mast, and was always very thick with me, had been holding a yarn with me, and just gone aft to his place on the quarter-deck, and I had resumed my usual walk to and from the windlass-end, when, suddenly, we heard a loud scream coming from ahead, apparently directly from under the bows. The darkness, and complete stillness of the night, and the solitude of the ocean, gave to the sound a dreadful and almost supernatural effect. I stood perfectly still, and my heart beat quick. The sound woke up the rest of the watch, who stood looking at one another. “What, in the name of God, is that?” said the second mate, coming slowly forward. The first thought I had was, that it might be a boat, with the crew of some wrecked vessel, or perhaps the boat of some whaleship, out over night, and we had run them down in the darkness. Another scream, but less loud than the first. This started us, and we ran forward, and looked over the bows, and over the sides, to leeward, but nothing was to be seen or heard. What was to be done. Call the captain, and heave the ship aback? Just at this moment, in crossing the forecastle, one of the men saw a light below, and looking down the scuttle, saw the watch all out of their berths, and afoul of one poor fellow, dragging him out of his berth, and shaking him, to wake him out of a nightmare. They had been waked out of their sleep, and as much alarmed at the scream as we were, and were hesitating whether to come on deck, when the second sound, coming directly from one of the berths, revealed the cause of the alarm. The fellow got a good shaking for the trouble he had given. We made a joke of the matter and we could well laugh, for our minds were not a little relieved by its ridiculous termination. We were now close upon the southern tropical line, and, with so fine a breeze, were daily leaving the sun behind us, and drawing nearer to Cape Horn, for which it behoved us to make every preparation. Our rigging was all examined and overhauled, and mended, or replaced with new, where it was necessary: new and strong bobstays fitted in the place of the chain ones, which were worn out; the spritsail yard and martingale guys and back-ropes set well taught; bran new fore and main braces rove; top-gallant sheets, and wheel-ropes, made of green hide, laid up in the form of rope, were stretched and fitted; and new top-sail clewlines, etc., rove; new fore-topmast back-stays fitted; and other preparations made, in good season, that the ropes might have time to stretch and become limber before we got into cold weather. Sunday, June 19th, were in lat. 34š 15' S., and long. 116š 38' W.
THERE now began to be a decided change in the appearance of things. The days became shorter and shorter; the sun running lower in its course each day, and giving less and less heat; and the nights so cold as to prevent our sleeping on deck; the Magellan Clouds in sight, of a clear night; the skies looking cold and angry; and, at times, a long, heavy, ugly sea, setting in from the southward, told us what we were coming to. Still, however, we had a fine, strong breeze, and kept on our way, under as much sail as our ship would bear. 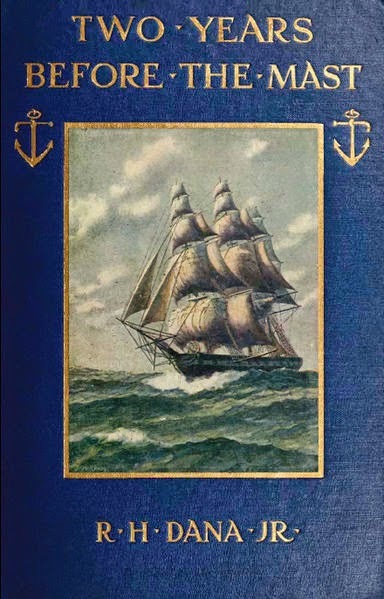 Toward the middle of the week, the wind hauled to the southward, which brought us upon a taught bowline, made the ship meet, nearly head on, the heavy swell which rolled from that direction; and there was something not at all encouraging in the manner in which she met it. Being so deep and heavy, she wanted the buoyancy which should have carried her over the seas, and she dropped heavily into them, the water washing over the decks; and every now and then, when an unusually large sea met her fairly upon the bows, she struck it with a sound as dead and heavy as that with which a sledge-hammer falls upon the pile, and took the whole of it in upon the forecastle, and rising, carried it aft in the scuppers, washing the rigging off the pins, and carrying along with it everything which was loose on deck. She had been acting in this way all of our forenoon watch below; as we could tell by the washing of the water over our heads, and the heavy breaking of the seas against her bows, (with a sound as though she were striking against a rock,) only the thickness of the plank from our heads, as we lay in our berths, which are directly against the bows. At eight bells, the watch was called, and we came on deck, one hand going aft to take the wheel, and another and another going to the galley to get the grub for dinner. I stood on the forecastle, looking at the seas, which were rolling high, as far as the eye could reach, their tops white with foam, and the body of them of a deep indigo blue, reflecting the bright rays of the sun. Our ship rose slowly over a few of the largest of them, until one immense fellow came rolling on, threatening to cover her, and which I was sailor enough to know, by “the feeling of her” under my feet, she would not rise over. I sprang upon the knight-heads, and seizing hold of the fore-stay with my hands, drew myself upon it. My feet were just off the stanchion, when she struck fairly into the middle of the sea, and it washed her fore and aft, burying her in the water. As soon as she rose out of it, I looked aft, and everything forward of the main-mast, except the long-boat, which was griped and double-lashed down to the ring-bolts, was swept off clear. The galley, the pig-sty, the hen-coop, and a large sheep-pen which had been built upon the forehatch, were all gone, in the twinkling of an eye—leaving the deck as clean as a chin new-reaped—and not a stick left, to show where they had stood. In the scuppers lay the galley, bottom up, and a few boards floating about, the wreck of the sheep-pen—and half a dozen miserable sheep floating among them, wet through, and not a little frightened at the sudden change that had come upon them. As soon as the sea had washed by, all hands sprung out of the forecastle to see what had become of the ship and in a few moments the cook and old Bill crawled out from under the galley, where they had been lying in the water, nearly smothered, with the galley over them. Fortunately, it rested against the bulwarks, or it would have broken some of their bones. When the water ran off, we picked the sheep up, and put them in the long-boat, got the long-boat, got the galley back in its place, and set things a little to rights; but, had not our ship had uncommonly high bulwarks and rail, everything must have been washed overboard, not excepting Old Bill and the cook. Bill had been standing at the galley-door, with the kid of beef in his hand for the forecastle mess, when, away he went, kid, beef, and all. He held on to the kid till the last, like a good fellow, but the beef was gone, and when the water had run off, we saw it lying high and dry, like a rock at low tide—nothing could hurt that. We took the loss of our beef very easily, consoling ourselves with the recollection that the cabin had more to lose than we; and chuckled not a little at seeing the remains of the chicken-pie and pan-cakes floating in the scuppers. “This will never do!” was what some said, and every one felt. Here we were, not yet within a thousand miles of the latitude of Cape Horn, and our decks swept by a sea not one half so high as we must expect to find there. Some blamed the captain for loading his ship so deep, when he knew what he must expect; while others said that the wind was always southwest, off the Cape, in the winter; and that, running before it, we should not mind the seas so much. When we got down into the forecastle, Old Bill, who was somewhat of a croaker,—having met with a great many accidents at sea—said that if that was the way she was going to act, we might as well make our wills, and balance the books at once, and put on a clean shirt. “’Vast there, you bloody old owl! You’re always hanging out blue lights! You’re frightened by the ducking you got in the scuppers, and can’t take a joke! What’s the use in being always on the look-out for Davy Jones?” “Stand by!” says another, “and we’ll get an afternoon watch below, by this scrape;” but in this they were disappointed, for at two bells, all hands were called and set to work, getting lashings upon everything on deck; and the captain talked of sending down the long top-gallant masts; but, as the sea went down toward night, and the wind hauled abeam we left them standing, and set the studding-sails. The next day, all hands were turned-to upon unbending the old sails, and getting up the new ones; for a ship, unlike people on shore, puts on her best suit in bad weather. The old sails were sent down, and three new topsails, and new fore and main courses, jib, and fore-topmast staysail, which were made on the coast, and never had been used, were bent, with a complete set of new earings, robands and reef-points; and reef-tackles were rove to the courses, and spilling-lines to the top-sails. These, with new braces and clew-lines, fore and aft, gave us a good suit of running rigging. Sunday, June 26th, when, having a fine, clear day, the captain got a lunar observation, as well as his meridian altitude, which made us in lat. 47š 50' S., long. 113š 49' W.; Cape Horn bearing, according to my calculation, E. S. E. 0.5 E., and distant eighteen hundred miles. Monday, June 27th. During the first part of this day, the wind continued fair, and, as we were going before it, it did not feel very cold, so that we kept at work on deck, in our common clothes and round jackets. Our watch had an afternoon watch below, for the first time since leaving San Diego, and having inquired of the third mate what the latitude was at noon, and made our usual guesses as to the time she would need, to be up with the Horn, we turned in, for a nap. We were sleeping away “at the rates of knots,” when three knocks on the scuttle, and “All hands ahoy!” started us from our berths. What could be the matter? It did not appear to be blowing hard, and looking up through the scuttle, we could see that it was a clear day, overhead; yet the watch were taking in sail. We thought there must be a sail in sight, and that we were about to heave-to and speak her; and were just congratulating ourselves upon it—for we had seen neither sail nor land since we had left port—when we heard the mate’s voice on deck, (he turned-in “all standing,” and was always on deck the moment he was called,) singing out to the men who were taking in the studding-sails, and asking where his watch were. We did not wait for a second call, but tumbled up the ladder; and there, on the starboard bow, was a bank of mist, covering sea and sky, and driving directly for us. I had seen the same before, in my passage round in the Pilgrim, and knew what it meant, and that there was no time to be lost. We had nothing on but thin clothes, yet there was not a moment to spare, and at it we went. The boys of the other watch were in the tops, taking in the topgallant studding-sails, and the lower and topmast studding-sails were and down by the run. It was nothing but “haul down and clew up,” until we got all the studding-sails in, and the royals, flying-jib, and mizen top-gallant sail furled, and the ship kept off a little, to take the squall. The fore and main top-gallant sails were still on her, for the “old man” did not mean to be frightened in broad daylight, and was determined to carry sail till the last minute. We all stood waiting for its coming, when the first blast showed us that it was not be trifled with. Rain, sleet, snow, and wind, enough to take our breath from us, and make the toughest turn his back to windward! The ship lay nearly over on her beam-ends; the spars and rigging snapped and cracked; and her top-gallant masts bent like whip-sticks. “Clew up the fore and main top-gallant sails!” shouted the captain, and all hands sprang to the clewlines. The decks were standing nearly at an angle of forty-five degrees, and the ship going like a mad steed through the water, the whole forward part of her in a smother of foam. The halyards were let go and the yard clewed down, and the sheets started, and in a few minutes the sails smothered and kept in by clewlines and buntlines.—“Furl ’em, sir?” asked the mate.—“Let go the topsail halyards, fore and aft!” shouted the captain, in answer, at the top of his voice. Down came the topsail yards, the reef-tackles were manned and hauled out, and we climbed up to windward, and sprang into the weather rigging. The violence of the wind, and the hail and sleet, driving nearly horizontally across the ocean, seemed actually to pin us down to the rigging. It was hard work making head against them. One after another, we got out upon the yards. And here we had work to do; for our new sails, which had hardly been bent long enough to get the starch out of them, were as stiff as boards, and the new earings and reef-points, stiffened with the sleet, knotted like pieces of iron wire. Having only our round jackets and straw hats on, we were soon wet through, and it was every moment growing colder. Our hands were soon stiffened and numbed, which, added to the stiffness of everything else, kept us a good while on the yard. After we had got the sail hauled upon the yard, we had to wait a long time for the weather earing to be passed; but there was no fault to be found, for French John was at the earing, and a better sailor never laid out on a yard; so we leaned over the yard, and beat our hands upon the sail to keep them from freezing. At length the word came—“Haul out to leeward,”—and we seized the reef-points and hauled the band taught for the lee earing. “Taught band—Knot away,” and we got the first reef fast, and were just going to lay down, when—“Two reefs—two reefs!” shouted the mate, and we had a second reef to take, in the same way. When this was fast, we laid down on deck, manned the halyards to leeward, nearly up to our knees in water, set the topsail, and then laid aloft on the main topsail yard, and reefed that sail in the same manner; for, as I have before stated, we were a good deal reduced in numbers, and, to make it worse, the carpenter, only two days before, cut his leg with an axe, so that he could not go aloft. This weakened us so that we could not well manage more than one topsail at a time, in such weather as this, and, of course, our labor was doubled. From the main topsail yard, we went upon the main yard, and took a reef in the mainsail. No sooner had we got on deck, than—“Lay aloft there, mizen-top-men, and close-reef the mizen topsail!” This called me; and being nearest to the rigging, I got first aloft, and out to the weather earing. English Ben was on the yard just after me, and took the lee earing, and the rest of our gang were soon on the yard, and began to fist the sail, when the mate considerately sent up the cook and steward, to help us. I could now account for the long time it took to pass the other earings, for, to do my best, with a strong hand to help me at the dog’s ear, I could not get it passed until I heard them beginning everything to complain in the bunt. One reef after another we took in, until the sail was close-reefed, when we went down and hoisted away at the halyards. In the mean time, the jib had been furled and the staysail set, and the ship, under her reduced sail, had got more upright and was under management; but the two top-gallant sails were still hanging in the buntlines, and slatting and jerking as though they would take the masts out of her. We gave a look aloft, and knew that our work was not done yet; and, sure enough, no sooner did the mate see that we were on deck, than—“Lay aloft there, four of you, and furl the top-gallant sails!” This called me again, and two of us went aloft, up the fore rigging, and two more up the main, upon the top-gallant yards. The shrouds were now iced over, the sleet having formed a crust or cake round all the standing rigging, and on the weather side of the masts and yards. When we got upon the yard, my hands were so numb that I could not have cast off the knot of the gasket to have saved my life. We both lay over the yard for a few seconds, beating our hands upon the sail, until we started the blood into our fingers’ ends, and at the next moment our hands were in a burning heat. My companion on the yard was a lad, who came out in the ship a weak, puny boy, from one of the Boston schools;—“no larger than a spritsail sheet knot,” nor “heavier than a paper of lampblack,” and “not strong enough to haul a shad off a gridiron,” but who was now “as long as a spare topmast, strong enough to knock down an ox, and hearty enough to eat him.” We fisted the sail together, and after six or eight minutes of hard hauling and pulling and beating down the sail, which was as stiff as sheet iron, we managed to get it furied; and snugly furled it must be, for we knew the mate well enough to be certain that if it got adrift again, we should be called up from our watch below, at any hour of the night, to furl it. I had been on the look-out for a moment to jump below and clap on a thick jacket and south-wester; but when we got on deck we found that eight bells had been struck, and the other watch gone below, so that there were two hours of dog watch for us, and a plenty of work to do. It had now set in for a steady gale from the south-west; but we were not yet far enough to the southward to make a fair wind of it, for we must give Terra del Fuego a wide berth. The decks were covered with snow, and there was a constant driving of sleet. In fact, Cape Horn had set in with good earnest. In the midst of all this, and before it became dark, we had all the studding-sails to make up and stow away, and then to lay aloft and rig in all the booms, fore and aft, and coil away the tacks, sheets, and halyards. This was pretty tough work for four or five hands, in the face of a gale which almost took us off the yards, and with ropes so stiff with ice that it was almost impossible to bend them. I was nearly half an hour out on the end of the fore yard, trying to coil away and stop down the topmast studding-sail tack and lower halyards. It was after dark when we got through, and we were not a little pleased to hear four bells struck, which sent us below for two hours, and gave us each a pot of hot tea with our cold beef and bread, and, what was better yet, a suit of thick, dry clothing, fitted for the weather, in place of our thin clothes, which were wet through and now frozen stiff. This sudden turn, for which we were so little prepared, was as unacceptable to me as to any of the rest; for I had been troubled for several days with a slight tooth-ache, and this cold weather, and wetting and freezing, were not the best things in the world for it. I soon found that it was getting strong hold, and running over all parts of my face; and before the watch was out I went aft to the mate, who had charge of the medicine-chest, to get something for it. But the chest showed like the end of a long voyage, for there was nothing that would answer but a few drops of laudanum, which must be saved for any emergency; so I had only to bear the pain as well as I could.